Akman, V, Bajaj, C, Franklin, R, Mitchell, J, Rohnert, H, & Wilfong, G. (1987). 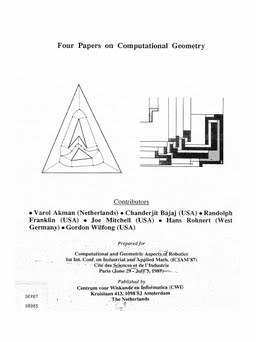 Four papers on computational geometry : [most of the papers will be presented in 'Computational and geometric aspects of robotics', a minisymposium (MS/85) to be held during the first international conference on industrial and applied mathematics (ICIAM. CWI.